Jorge Castillo: There are many variations of mojo sauce. It is the signature marinade of Cuba and it finds its way into many different dishes. Raúl Musibay: Many mojo sauces do not include oil. When you are roasting a pig, the oil is not necessary -- there's plenty of fat in the pig! Glenn Lindgren: However, for chicken, fish, beef, and so on, a mojo sauce with oil will help prevent the meat from drying out in the marinade. Raúl Musibay: Cubans also call mojo by its diminutive -- "mojito." This can be confusing to some, because there is a drink of the same name. Jorge Castillo: With oil or without, the key element is sour orange, the almost bitter Seville orange that grows throughout Cuba. Many Cubans have their own sour orange trees in South Florida -- some from seeds smuggled out of Cuba. The key to making mojo is in the proportions. The key to making mojo is in the proportions. The nice thing is that you can make exactly the amount you need. For a pig, we use four or five large HEADS of garlic! That's approximately 70 to 80 cloves. Use a mortar and pestle. For every ten cloves of garlic, add 1/2 teaspoon salt, six black peppercorns, and some oregano. Mash them all together into a paste. Scoop the paste out into a separate bowl. Continue this process until all of the garlic (all five heads) is mashed. Stir in sour orange juice. (Five heads of garlic should be added to about 1 quart of sour orange juice to make a mojo for a whole pig.) Let sit at room temperature for 30 minutes or longer. Use immediately to season the pig or refrigerate for later use. To make a smaller amount, reduce the amounts, but keep the proportions. For example, to make 1 cup of mojo, use about 1 head of garlic, 1 teaspoon of salt, 12 black peppercorns, and 1 cup sour orange juice. 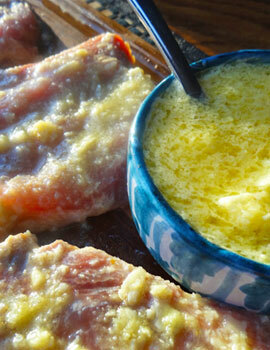 TIP: This is a great marinade for just about anything, including pork chops as seen in the photo above. The mojo with oil marinade is best for chicken, duck, fish, and so on. The oil prevents the meat from losing fat and moisture. Mash garlic, salt, and peppercorns into a paste, using a mortar and pestle. Stir in sour orange juice, onion, and oregano. Let sit at room temperature for 30 minutes or longer. In a saucepan, heat olive oil to medium hot (approximately 220 degrees F) and remove from heat. Carefully whisk in the garlic-orange juice mixture (prepared above) until well blended.